As a Toronto wedding photographer, there are few locations that I like more than Evergreen Brick Works. This wedding venue is perfect for small or large parties, making it one of the most sought after establishments by brides in Toronto and surrounding areas. If you plan to have a summer wedding, The Pavilions offers 27,000 ft.² of space and can accommodate up to 900 guests should you have such a lavish wedding. If the weather collaborates, you might want to have an outdoor ceremony on the Frances and Tim Price Terrace or in the Weston Gardens. Christina and John chose to have an outdoor ceremony on the Frances and Tim Price Terrace overlooking the ponds and the Weston Family Quarry Garden. Fortunately, the weather was magnificent on this beautiful August day. This image was captured during Christina's getting ready for her wedding ceremony. After taking plenty of candid photographs of her in her bridesmaids enjoying the day, it was time to leave for the ceremony. As such, I asked Christina to put on her shoes and I took this beautiful photo of her. There are a few things that make this an intriguing image. First, I deliberately cropped to the image right above Christina's beautiful lips. According to the Gestalt principle of closure, this incomplete image increases the mystery and creates tension in the photo. Your mind is forced to reconstruct the whole image, which makes it special. Also, by not seeing the brides eyes, we are directed towards the bride shoes, which become the main subject of this image. This is a technique often use in fashion magazines where, to emphasize the role of the products, the models often don't look at the camera. Missing the eye contact, we the viewer, can the picture and focus our attention towards a different subject, which in this case is the bride's shoe. Here is how our eye travels in this frame. We start on the top left of the picture, then me and we move directly to the bride's lips, then we follow her hand towards the bottom left of the frame. The diagonal line created by the bride's hand gives this image dynamism. The composition of this wedding photo is impeccable. The bride was placed along the last guideline on the rule of thirds grid, leaving plenty of negative space on her right. By placing Christina so close to the edge of the shot, I deliberately created tension in this image. 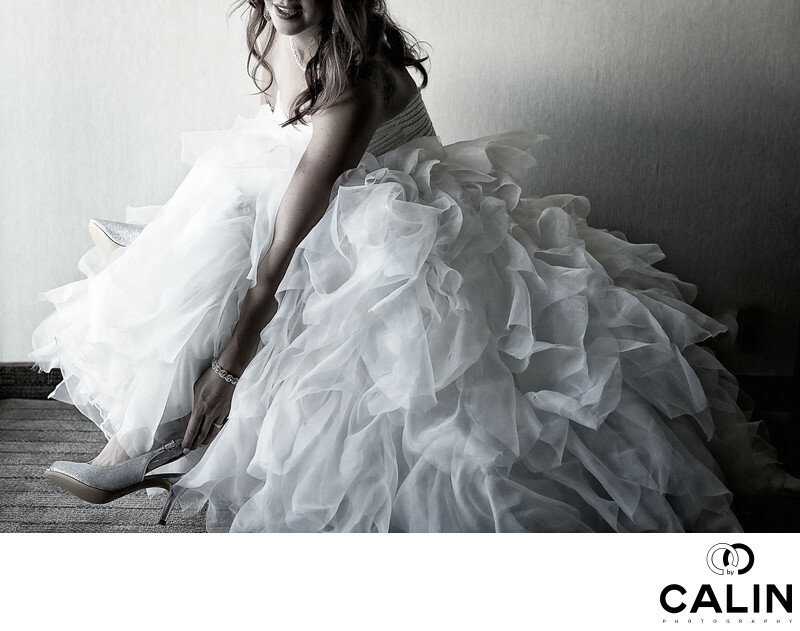 To create this or original wedding portrait of the bride, I used a 35mm lens on a 5D Mark III camera. Because the bride was positioned close to the window, the light fall off creates a natural dodging and burning of the photograph, with the bride being the brightest part of the image. That emphasizes her importance. In postproduction, I plead with a few variations of this final shot. This is the option I like the most, where I desaturated the image to give it a cinematic look. Also, I added a bit of grain which increases the emotion evoked by a picture at a subliminal level.